Click above and vote for Paul Posluszny (sorry Danny) and Jeremy Kapinos for the national football honors. Paul currently trails in the "popular vote" in both the Bednarik and Butkus Awards! Posluszny named one of 3 finalists for Lott Trophy. Click here for all of your Bowl Game questions. SAAB - the Student Athlete Advisory Board is hosting an auction of fun items from various teams. Proceeds from the auction go to the Penn State Dance Marathon. 3 finalists, and 2 of them are Penn Staters and all 3 are Big Ten. Connor and 2005 winner of the award, Posluszny are joined by michigan DE, LaMarr Woodley as finalists for the honor, awarded to the nation's top defensive player. One of 3 finalists and only finalist from the Big Ten - Interesting that Jeremy gets this national recognition - but only 2nd Team All Big Ten. Posluszny and Scirrotto on first team. What a great honor for sophomore Anthony Scirrotto! "Don't worry about it. I'm getting an egg. Two." My mother takes full responsibility for the PSU win. We have an ancient tradition in my parents' home that before a PSU game one family member yells "Who's gonna win?" and the others respond "Penn State!" (must be repeated twice, followed by "Let's go State!") - well, she's been ill this past week and was sleeping when we left for the game on Saturday morning (6am) - so, although I said "who's gonna win" (fully aware that she was still in bed) there was no response. I couldn't get ahold of her before or during the first half of the game - but early in the second half she answered and I chanted into the phone "who's gonna win?" - and then they did. She called me Sunday night and said "just one thing. Did I singlehandedly win that game yesterday?" Yes, Mother. Yes, you did. Probably because they don't actually watch us play - PSU's BCS ranking is #25 - the computers have us ranked at #21. 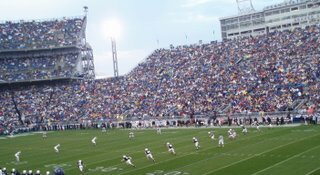 With the passing of legendary coach, Bo Schembechler, as we prepare to wish farewell to the Penn State Seniors - I feeling a little introspective about football 2006. We came into the season with some cautious optimism -Posluszny assured us that he was 100% recovered from his Orange Bowl injury; recruiting had gone well in the spring bringing in some more speedsters, OL candidates and more - Morelli looked decent in the rain soaked Blue White game. As far as the newbies have gone - we've seen Chris Bell, Maurice Evans, Andrew Quarless, AJ Wallace in games and get their names called over the PA system. Morelli made Quarless his go-to guy for a few games. One thing I will say - the field has kept up beautifully this season - through all of the bad weather, it still looks fresh and clean. I know, I know, it's not our football - and it's not even the off season yet - but, just to add my own 2 cents - I'd go see David Beckham play soccer - I'd go every chance I got - and I can't be alone in that. MLS would be daft not to bring in a guy with his name recognition - the people will go - and they will get hooked - and they'll want to watch it on tv - and they'll get favorites - We Americans are sports fans, and just give us a reason to watch, and we will. Paterno's induction into the Hall of Fame to be postponed due to injury. Penn State beat up the Temple Owls on Saturday, while Mother Nature beat up on us fans. 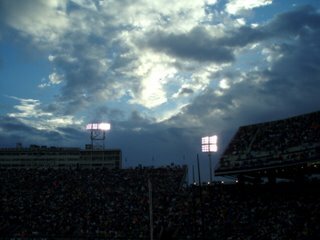 Actually, if it had to be raining, it wasn't that bad, as the air temperature was warm - and the rain did hold off until an hour or so before the game, so the tailgate wasn't too badly affected. 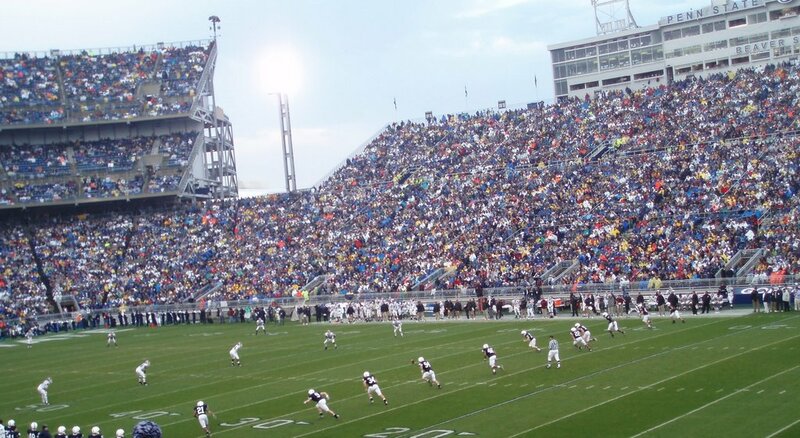 Penn State's offense (other than Tony Hunt) didn't look particularly great - Temple's D was just not good. The kids are small - and the weather was crap. It was almost criminal sending the PSU defense out against those kids - they (temple) do have some speed - they just didn't have the blocking to get anything started - Penn State won, 47 - 0. Joe Paterno will not coach this Saturday against Temple - his doctor(s) advised that the best course of action would be for him to remain in the hospital or at a rehab center to ensure that his leg remains elevated and, primarily, to avoid blood clots. Joe made the official decision today so that the focus could move away from him and center on football. The doctors had stated that the only way Coach Paterno would have been able to coach on Saturday would have been from the press box and that he will not be on the sideline again this season (which isn't too surprising considering that next week is the last regular season game). We here at 2theLion take blood clots very seriously (as should we all), and we understand Coach Paterno's desire for the team, coaches, media and fans to concentrate on the game, and not him. However, it will be odd being in the stadium without Joe's being there. I'm old enough to remember when Joe didn't make the trip to Syracuse in 1977 after his son suffered a head injury - that's a 30 year old memory of a little girl - it was weird then - it's still weird today. We all wish Coach Paterno a speedy recovery and all the best. That said we also hope that the Lions can get geared up to play Temple this weekend and give Joe something to smile about as he enjoys the stadium view from his hospital bed. Nice recap of Sabastianelli's and the coachs' press conference. ...really hit Joe hard. If you've seen the footage from the game, you know how painful/horrific the hit looked. Joe's a trooper though, he tried to keep standing but was eventually helped to the bench and then went to the locker room to be checked out. These aren't the problems of a 79 year old - this would have happened to anyone standing there and Joe's lucky that he wasn't more seriously injured (dude is fit) - if he hadn't been hurt earlier in the season (broken ribs) he'd of been in even better shape and I'll bet the uw kid would've had a concussion. Regardless, Joe has had surgery and, reportedly, is doing well. He's a scrappy guy - you've got to give him that. And yeah Craig James, thank goodness Joe did take his Geritol (do they even make Geritol anymore?) on Saturday. I didn't hear James' comments first hand on Saturday - but I did get to hear his apology - which was very odd - I said "what on earth did he say, to warrant such a comment?" - So, he called Joe an "old fart" - as many have pointed out, he is an old fart - but I think it was more his delivery "way to stick it to the old fart" (speaking of wisconsin's 'brilliant' abuse of the new clock rules) - I'd have been po'd if he'd said "way to stick it to the fabulously intelligent, more fit than I'll ever be, Saint Joe" - first of all, Mr. James, we know you hate Penn State, you have since you were in college (talk about sour grapes); you have been blatantly not a fan through out your commentating career; you said, just last week (again, on camera), that you "just don't like Penn State" - but please, don't kid yourself that Joe Paterno was "fooled" by anyone - Joe himself is the one who said to the press, and the big ten, before the season started that the new rule about the kicking game could be exploited - and I really don't care if you jumped on the Penn State bandwagon last year - or if you believe you were the "voice of reason" in the low years - you just wanted to disagree with PSU fans - we're so silly - why would we want to replace Joe, the old fart? Why does one announcer get suspended for calling himself "gay" - but all Craig has to do is make an extremely defensive "i didn't do anything wrong" statement on air? It's the pattern of biased broadcasting that is distasteful. The articles about this have been few - and none on the major sports outlets - Penn State fans are helpless, even if PSU as an institution would want to be outraged (which they won't), because of the ABC/ESPN big ten tv contract - it's not like we'll stop watching (is it?). In other regards, the Lions, again looked flat and were completely ineffective on offense. It's a bad loss - it's a 2004 type loss. Something has to change. I like wisconsin fans - they're probably my favorite "not us" fans right now. This sentiment has been developed over the years. The folks I know who graduated from uw are, generally, swell folks and I love hearing stories about wearing bib overalls and dancing in the stands (I attribute much of their method to the frightfully cold weather). The last 2 home wisconsin games have given us the opportunity to meet and visit with other alums, all of whom have been a lot of fun and "good fans". Penn State travels out to Madison this weekend to face wisconsin. The badgers currently boast a record of 8-1 with their lone loss coming at the hands of the wolverines. They have an excellent running back, a 14th year (or so it would seem) senior quarterback, a big o-line and a very good defense. Compared to Penn State, which I would say has a good running back, a rookie quarterback, a young o-line and a good defense. And, it's supposed to be rainy and chilly (well, chilly by our pampered Pennsylvania standards).